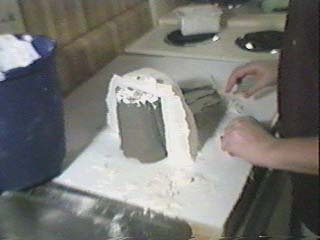 You want to make a separate mold for each side of the sculpture you need to cast. First lets get our sculpted piece ready. This is a sculpted bicep for a stormtrooper costume. Normally I would have this sculpture on a mannequin and would have to navigate around the other parts of the cstume to plaster cast this one part. 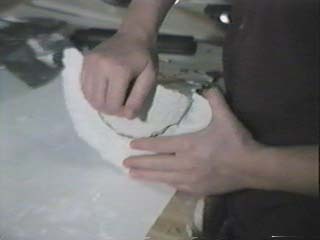 The technique for pulling plaster casts from any sculpture is the same whether you work on a mannequin or make parts separately (like shown here.) Just modify the technique as you work. You'll need to coat the sculpture with vaseline or some sort of release agent so that the Plaster will not adhere to the clay. This will make pulling the plaster cast off easier. An Acrylic "Clear Coat" paint will work too. Basically you want a protective layer between the clay and the plaster. First thing we'll do is block off the side we want to cast with sheets of tin or plastic, we call these Retainer Walls. This will help keep excess plaster from spilling over and damaging the opposite side of the sculpture that we are not casting. 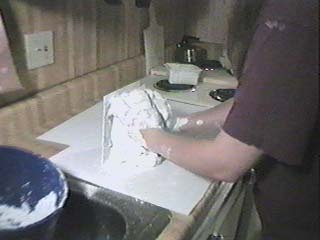 Here is a bag of plaster. Actually this is "PLASTER OF PARIS". 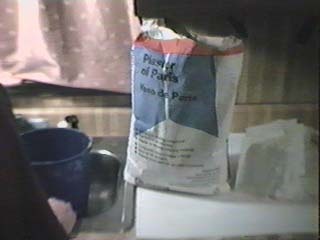 I do not recommend "Plaster of Paris" for casting because it is brittle and not too strong. Use "ULTRACAL-30" or "HYDROSTONE". These can be bought at a Gypsum Supply House. Look in the Yellow Pages for an address. Ceramic supply houses carry gypsum products also. Lets make up a small batch of plaster so that we can get an initial coat on the sculpture. Make it creamy in consistency for the first coat, like thick milk soup, or a milkshake. 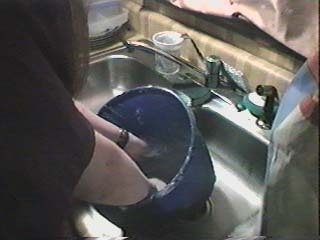 I sift the plaster into a bowl of water. 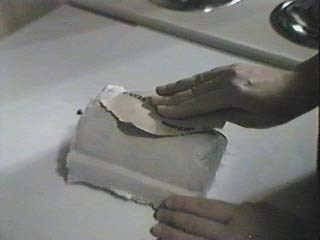 Let the plaster natural absorb the water as it falls down through the water. 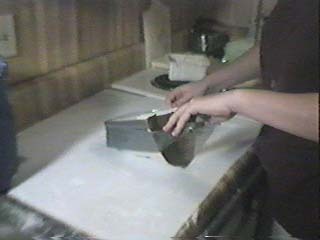 This sifting method is the best way to ensure the plaster mixes properly with the water. 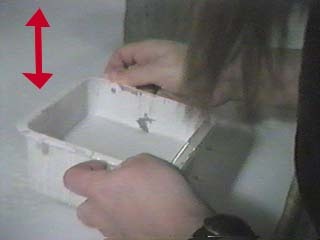 Once the plaster is all mixed... vibrate the container on the table to get the air bubbles to come out of the mixed liquid. Now take a brush and brush on the first coat of plaster. This will help ensure that your plaster will have as FEW air bubbles as possible. Once the first coat is dry... 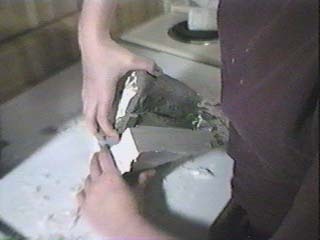 Mix up a large batch of plaster to "reinforce" and finish the Cast. Just goop on the stuff. 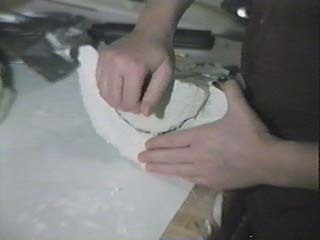 Building the cast to about 2 inches thick. 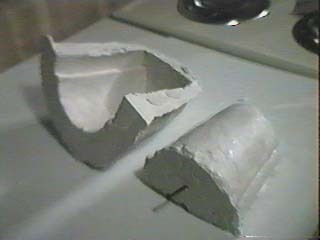 Larger sculptures such as chest pieces might need additional reinforcement with Plaster bandages. You can get those at Hobby Stores or Medical Supply Houses. Heres the final product. Let the plaster cure for the entire 6 -8 hours that it needs to cure. Not letting it cure fully may reduce the plasters strength. 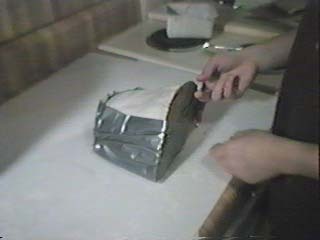 You can wrap a plastic bag over your mold, therefore trapping moisture around the curing plaster. I hear this method helps to minimize cracks and stress points that can occur in the chemical reaction process. 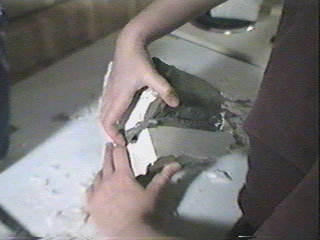 Now that the casting is done... let's remove the retainer walls and take out the sculpture from the cast. 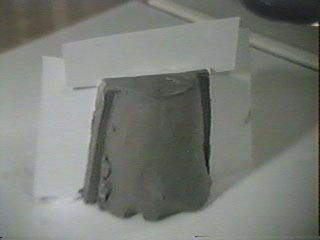 IF you coated the sculpture with a release agent you'll notice that the clay does not stick to the plaster a whole lot. If you didn't coat the sculpture... get ready to have a hard time getting these two pieces apart. You may break your cast if your not careful . Gently, but firmly, pull the two pieces apart!! Here's the hollow cast. 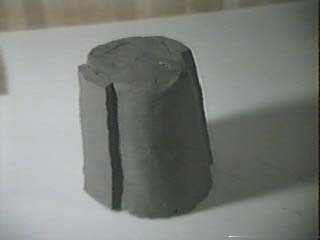 Notice the smooth edges caused by the retainer walls. 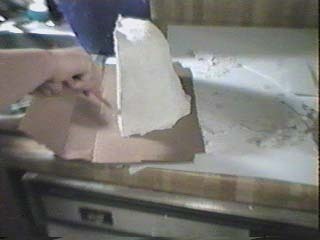 This edge helps a great deal with the pouring of the plaster mold. It gives you a definite edge to relate to. Now lets "CAP OFF" the open end of the cast. I just used a piece of cardboard and some duct tape. 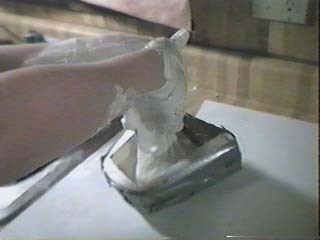 Now coat the inside of the cast with vaseline/release agent again. This time make sure you coat every inch with it. 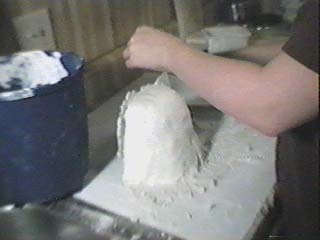 We will POUR plaster inside the Cast to make the final MOULD. If the two pieces of plaster bond to each other... Oh, Boy... you best be ready to the CHISEL the two pieces apart! 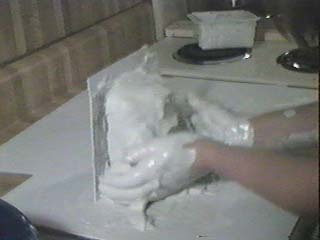 Once the cast is ready... mix up a batch of plaster and pour it in. 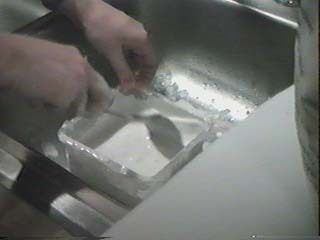 You may need to do two pours for larger moulds...i.e. chest, back, buttocks and thighs. 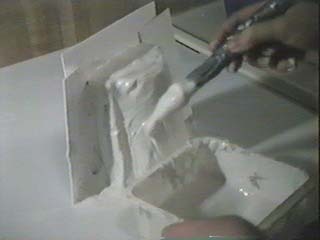 Pour the liquid against a side wall of the cast. This will help eliminate air bubbles. 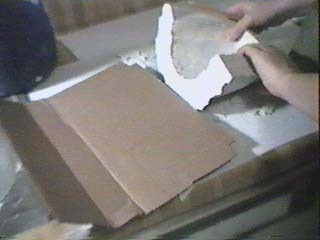 Let the plaster cure and then pull the two pieces apart. This is tricky. 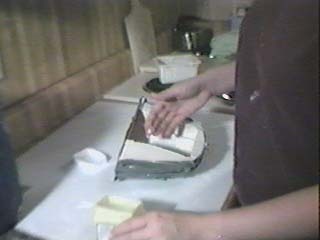 On this occasion we had a hard time getting a grip on the final MOULD and couldn't pull the pieces apart. We finally had to drill a hole into the plug and screwed in a "LONG" Anchor Screw so that we could grab something. Here are the final pieces. Notice the Anchor Screw in the final PLUG MOULD. 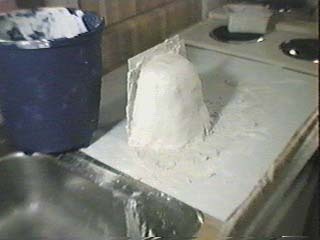 You can now make more plug moulds from the plaster cast, if you wish. 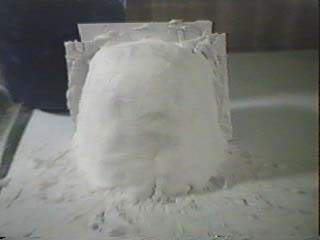 Note: In tutorials and vacuumofmirng instructions the lone word "PLUG" refers to a finished "plug mold". You can sand the plaster down to a smoothness you desire. Using an electric sander is highly recommended. Buying a Speed-Adjustable Orbital Sander is also suggested... but those cost about 100.00 U.S. Dollars. Enjoy your new found hobby!........ Now on to Building a Vacuumform Table.